May I wish everyone involved in our enterprise a happy, healthy and prosperous New Year. 2012 was quite difficult to get through financially although there have been a few highs to keep the ship afloat. 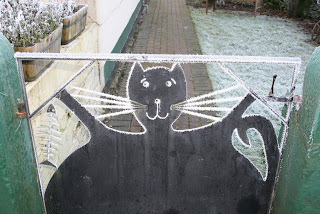 The first three months of 2013 will be a strain with little income in prospect but we should bust forth in April with a host of activities to swell the coffers. The great blessing would be some more kindly weather to allow us to get on top of routine maintenance of our line and encourage the visitor to come and see a superb Railway. known as Area 51(something to do with UFOs) underwent further sorting. to settling in to them. Leigh has reported the final results for the 2012 Santa season with a super 47% revenue increase over the 2011 season. The LCC and Elf in Chief calculated that some 40 volunteers were involved in delivering the 12 trains we ran to the universal satisfaction of all those that visited us. A tremendous effort by all concerned and will take some beating in 2013. I met one of yesterday's families who had been with us each of the nine years we have been putting on a Santa show from the early beginnings on the Gorsey Bank line with the interesting generator van, through the Ravenstor theatrical productions including the pirate ship to the current incarnation of the journey to the North Pole. I wish all the followers of these daily musings a very happy Christmas and look forward to the adventures that 2013 will bring. Santa team for all their hard work and effort towards this purpose. of the class 119; and the first replacement door was fitted to BSK 34625.
winter timetable, on Thursday the 3rd of January. there be something intelligent on the telly for once. The inclement weather did nothing to dampen the spirits of the Santa Special team who looked after our visitors with their usual good charm and expertise. I have attached a photograph of the crossing at Gorsey Bank which captures today's conditions. Down the yard the LMSCA were in attendance replacing doors on the BSK. Members of the 8F group continued their endeavours in the shed with the automatic coal feed and John A. continued painting the the driver's cabs in the bubble car. The DMU restoration team were out in force today as their restoration of the class 119 gains momentum. The interior team continued preparing the floor for the fitting of new linoleum tomorrow and mounted the original mirrors in the passenger compartment. The external team have now connected both alternators and have fitted the air tanks. The day started with an unfortunate and spectacular derailment on Road 2 in Wirksworth Yard with many vehicles considerably damaged necessitating the attendance of some 12 Inspectors from the Rail Accident & Investigation Branch. Fortuitously this was a virtual derailment and formed part of a training day. The team were fuelled during the morning by a supply of Pullman Bacon Sandwiches and declared their exercise a success in the most inclement of conditions which duly replicated the real thing. The PWT undertook a review of the flooding that affects most of our line with Richard photographing the key problem areas which will need further drainage work when conditions permit. Care will need to exercised for our remaining Santa Trains and those planned over the next ten days or so. The dmu team replenished the Santa train with engine and heater fuel and spent considerable time in the pit tending to the fitting of alternators to the Class 119. Within this vehicle there was a continued tedious cleansing of the floor to accept new lino which could be fitted on Saturday. The VCT took a well deserved Christmas lunch at the Railway Hotel, Shottle and the Pullman Buffet Car served our RAIB customers, staff an other visitors. Leigh concluded his splendid efforts with the Santa train bookings where we have achieved a splendid 46% growth over last year with the great preponderance being online. Our Santa product seems to have gone world wide with a Tasmanian address featuring this weekend. Thanks also go to Neil, Eric and Rodney who have put a great deal of effort into making awareness of the Santa "product" visible to a larger market. We are tantalisingly near a significant milestone in revenue if we manage to tease out another £162 over the next three days. The trains this weekend will be very testing on the Santa team and will be successful if we "keep calm and carry on". > moderate only and not loud enough to be considered a noise nuisance. > UVA, UVB and the overwhelming effects of Glory. > action will be taken against those found guilty of this offence. As we approach the shortest day and begin to end dark mornings and afternoons the show goes on. The PWT moved to Shottle for further site clearance work and a modest contribution to global warming. The SBT moved ever forward and I had hoped to bring you a photo of their progress but was pleasantly kept at base by a customer who has become regular with small additions to our revenue. The LCC had hauled her family into the final preparations for the upcoming Santa weekend. They undertook a present audit to ensure everything was in place and then gave the Santa train a good clean. Another example of dedication, out of sight, that will ensure our final weekend will be successful. The Pullman Buffet Car served our regulars from the town of Wirksworth and benefited from our customer who enjoyed the famous Pullman Bacon Sandwich. The Booking Hall processed the tail end of our Santa bookings as we near capacity this weekend but is now looking forward to all the possibilities in 2013. An approach to a number of coach companies has produced its first firm booking. We have our last smattering of Santa Train tickets available for this coming Saturday 22nd only. These will be taken off sale at around 15:00 tomorrow (Thursday 20th) if there are any left. Sunday 23rd is already full. Please click here for more information and to book online. A productive, as ever, working day where progress was made on a number of fronts. The VCT continued their attack on the vegetation south of Idridgehay and their unceasing work shows up when we have inclement weather and the trains keep running. The national network always has a catalogue of problems with fallen trees, washouts and communications problems that generally reflect the lack of management of the lineside over a number of years. We are not perfect but are really getting on top of our estate management. The team should rejoice as they tuck into their Christmas dinner on Thursday. The PWT concentrated on Shottle with further lineside tidying up whilst admiring the SBT's work on Shottle station. The DST continued with renovation and maintenance of their stable of three locomotives and the LMSCA pushed on with the Brake Third Open and the Mark 1 BSK. The BSK enjoyed the fitting of a "new" door and the preparation of a second replacement. The BTO had another window cut out as the brake compartment is reconfigured. The dmu team tended to the Santa train with a wash of its west side. The Pullman Buffet Car enjoyed a fairly quiet day but the Booking Hall dealt with the paperwork following last weekend, processed Santa bookings and began to turn their attentions to next year's group bookings. David tended to Gorsey Bank's level crossing lights and remedied a fault with the Buffet Car electrics. The Filing Fairy was in attendance as we pursue the ultimate goal of all competences being evidenced. PS - Having participated again in last week's Santa operation I can only congratulate the team on both days for all their energy and dedication to create a happy and welcoming environment for our customers. The smoothness of the affair is doubly helped by the dmu maintenance team and the booking process that is properly assembled for the day to enable a smooth check in. We approach our final weekend with a further challenge that will be well met. small guests occupied and amused. history and operation of pillar drills. On a cold but sunny day staff at Derbyhires favourite friendly railway geared them selves for the seasonal rush of children and their families eager to travel on the santa specials to the North Pole. upon their return it was lovely to see their smiling faces whilst the adults were seen to be carrying the goody bags the children had recieved from Santa . It was also nice that many of these families praised the staff manning the trains for the proffesional way in which they were looked after them , Well done to you all. The Pullman buffet staff also recieved praise for the warm food which it had to offer the passengers and vistors to our railway. Down the yard the Dmu team worked hard Leigh and Brian could be heard stripping in the 119 as Ben and Rob tinkered with hammers ( with alot of ouches as they missed the target ) whilst repairing the alternator. The steam group where to be found hard at work on Katherrine as Bob was found to be rubbing down Henry ( ready for his new coat of paint ) . Late in the morning the brake was seen sending out smoke signals from where the Hot chesternuts should have appeared however it was late into the afternoon when Mr Oakes turned up with his warm nuts , which the staff rapidly eat. Im sure as we close the doors on another day the Malt Shovels warmth would be more enjoyable than a trip to the supermarket. From a winter wonderland the day moved through a black ice period to incessant rain as temperatures rise. The LCC was somewhat delicate with a cold but heroically soldiered on to sort the presents for the weekend's Santa bookings and gave the Santa train a clean. I suspect a quantity of restorative Scottish product will be needed this evening. The "Bubble Car" which has benefited from almost daily attention over the last few weeks has had further attention to the refurbishment of the south end cab. The Pullman Buffet Car traded erratically due to being frozen up for a couple of days but it looks as though normal service will resume for the weekend. The Booking Hall prepared for the up coming weekend and dealt with some last minute Santa customers. It is immensely satisfying that we are now some 29% up on this time last year with over 75% booking on line. We are by no means in the big league but we are certainly catching up and I do thank everyone involved in bringing cash into the enterprise when it is most needed. Another subarctic day inhibiting all but the "easier" jobs. The dmu team made further progress with the "Bubble Car" and checked over the Santa set topping up the heater fuel. The Oaks Brakevan was shunted into Platform 3 where it will be a centre of excellence for roast chestnuts over the next two weekends. The PWT were quite frustrated by the low temperatures but used the available time to consign some lineside debris at Shottle by attempting global warming. The Booking Hall continued to process Santa bookings that are heading for a record on our Railway. The Pullman Buffet Car struggled with frozen pipes but traded to the intrepid. There is change forecast for tomorrow so I suspect we will be dealing with the inevitable bust pipes as the next part of winter joy. 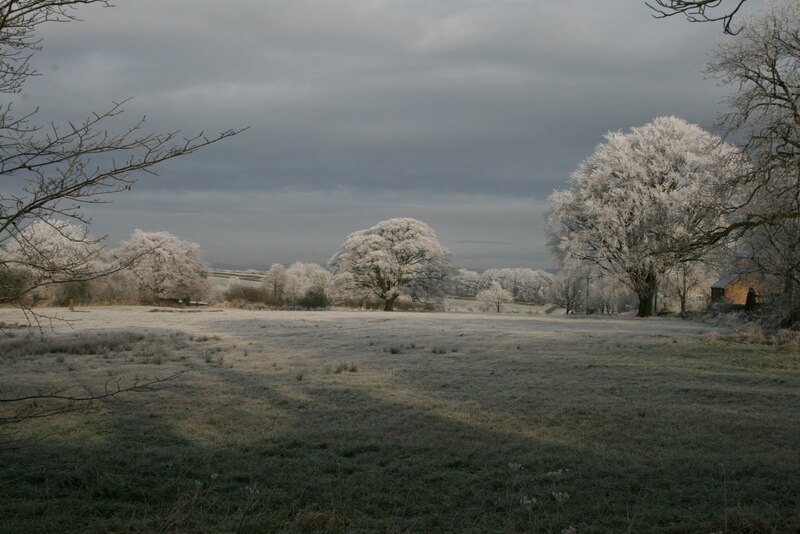 In the perma frost area of Derbyshire I never cease to be amazed at the dedication of our teams. The PWT undertook a whole line track patrol with no concernes reported and the much ignored SBT laid out blocks ready for next week as temperatures frustrated any attempt at mixing concrete. Yesterday they did manage some concreting of progress to date. The end product at Shottle will be another credit to their endeavour - maybe Hazelwood will be their next destination? We entertained a very cold customer with three road/rail hydraulic platforms where things didn't go to well for them but proved the value of testing out of the limelight. The Bubble Car enjoyed the attentions of John Allsop to the woodwork in the south cab and the start of new Formica panels to restore this part of the vehicle. The Pullman Buffet Car was frozen up all day but benefited from our customer's need for sustinance. Santa bookings still challenge the Booking Hall and it was good to see a toe in the water addressed to potential coach tour operators. Our wall repair men were in operation and a joinly funded task by the Company and EVRa to prevent the wall alongside the narrow gauge collapsing. A photo today illustrating that when I say it is cold it really is no matter how attractive the picture looks. I have to declare being a little detached from events today after enduring a morning at headquarters and then retiring to the domestic accommodation as the temperatures plunged. Nonetheless various teams braved the conditions and achieved against all odds. We welcomed a further visit by Amec to inspect further bridges and structures on behalf of Network Rail and ourselves. The PWT had a mixed day of clearing a number of outstanding tasks including a sort of recovered sleepers between "garden quality" for sale and those that might be reused for sidings. Stone was recovered from Wirksworth to upgrade the VCT's base at Hazelwood and the VCT assisted with the reception of this much needed material. The DST continued with their work on our three steam engines and the LMSCA forged ahead with the BTO and Mark 1 BSK. Fred and Iris gave the Mess Hall a good clean and the Pullman Buffet Car entertained some hardy souls. The singular success was the continued popularity of Santa necessitating extra effort in the Booking Hall as we scythe past last year's financial achievement. The interesting statistic is that the online booking and shop has passed £15,000 this year which is a mix of all the offers made through this medium. My thanks go to Leigh and Robin for making this all possible and showing the future to us. PS - The Pullman Buffet Car will only close Christmas Day and Boxing Day but operate between 1000 and 1400 from the 27th to 31st December with an emphasis on warm comfort food! A pleasant charter with Iris this morning for Alfreton Special School that took them to the North Pole. All were quite delighted by the hospitality shown by Lewis, Andrew, Eric and John leaving us with a warm glow. This afternoon we hosted the Environment Agency and Derbyshire Wild Life Trust as we cemented our involvement in the Ecclesbourne Project that aims to undertake a range of activities to improve the river and its environs together with raising the profile of the Valley. Pat Craft has kindly agreed to represent us on this body which should have many spin-offs to the benefit of the Railway. The Booking Hall had many Santa enquiries and the Pullman Buffet Car had another satisfactory day. A slightly damp start to Santa's Sunday, but the sun came out and Santa and his boudoir chugged quietly down to North Pole with its happy and occasionally musical load. A very fabulous time was had by all and much joviality was spread around together with mince pies and a strangely tea-coloured mulled wine. In the background, the undergrowth was tidied up, the LMS brake van had finishing touches applied to its interior paintwork and the DMU team spent the day trimming themselves. Well it has arrived, Day 1 of our Santa Train programme with the two trains delighting the small people and their adults who were all captivated by this year's offering. It is tremendously labour intensive to deliver a quality "experience" and involved some 18 volunteers today including the "standby" fitters who made sure the train was warm and comfortable. This together with all the preparation work deserves a big cheer from anyone interested in our enterprise. We were doubly blessed today with cold, clear, sunny weather and a very good supporting cast. Other activities on site were the LMSCA continuing with the restoration of the BTO and BSK, the Oaks Brakevan project nears completion and a lone member of the DST rubbing down Henry Ellison as part of its painting process. The dmu team resolved a sticking EP (electro-pneumatic) valve on Iris so that it is ready for a charter on Monday and the Pullman Buffet Car had quite an active day, a feature we didn't have last year. PPS - Difficult to take acceptable photos of the Santa operation but this is the 1415 to the North Pole ready for departure with Rod Birch in role. Every effort today concentrated on completing the preparations for our first Santa Train tomorrow. The combined and coordinated efforts ensure the fuelling of the Santa Train was completed, the preparation of Wirksworth and North Pole stations look the part and the Train is in good order with the correct mix of presents for the children are in place. My thanks go to all active in delivering this part of our enterprise where you get no second chance to get it right. Iris was checked over for its role on a charter on Monday and the Booking Hall coped with station decoration together with the usual run of enquiries. The Pullman Buffet Car benefited from Norfolk Dave's walking party amongst other visitors and staff on site. Any volunteer entering the site over the next three weekends should not be surprised if they are roped into this annual adventure. Another perishing day as most efforts were devoted to getting ready for the first Santa train on Saturday. The train itself was given a check over and partially fuelled as the expected delivery today was running behind schedule. The PWT tripped the Christmas Tree, Bench, Gate, Water and Bus Stop to the North Pole and whilst there relocated the portable toilet so as not to offend the neighbours. Only a visit to the North Pole will reveal why there is a Bus Stop there! Decoration of the North Pole was also in progress. The VCT continued their attack south of Idridgehay with a magnificent four fire day making them the only team to be warm today. Mike and John fitted the wooden window frames into the south end of the Bubble Car and replaced the roof dome. The Booking Hall was pleasantly busy with Santa with an end of day round up revealing we are some 8% ahead of this time last year. The Pullman Buffet Car was pleasantly busy where, amongst the unexpected visitors, there was a couple from Hove on a short break in the area who stumbled across us by accident. Our new Permanent Way recruit, Steven, turns out to be the grandson of Driver George Repton who is commemorated on the platform seat by the garden on Platform1. PS - two omissions from last night's contribution. A major one was not to recognise the splendid progress being made by the SBT who laid 30ft of single course stone work, 20ft of further footing work and 20ft of concrete behind the first course. A great achievement given the weather. The LCC reminds me station decoration was aided, in addition to those previously mentioned, by Rodney and John Saville and my thanks go to them for working in most unpleasant conditions. Why don't we have Santa trains in July? We post up to date information, photographs and other news regularly on our Facebook page. It is a great way to keep up with our progress alongside our daily reports. Currently, we have a competition on the go. Simple 'like' our page with a chance to win a pair of Day Rover Tickets for 2013. The tickets will go to the 400th 'like'! The real heroes of the day have been the team that have decorated the Santa train that has involved the LCC, husband of LCC, JHT and Val to create a new Santa Grotto as well as the three coaches that form this key part of the next three weekends. Their dedication is not without recognition! In parallel with this have been the exterior lights, tree decorations and many other parts that will make the Santa "experience" quite magical ably lead by Anton. All this activity has been conducted in sub zero temperatures that reduces the will to live. The PWT set sail for Duffield and Shottle removing the signal formerly known as DY547 together with sand surplus to the construction of Duffield station and then loading "garden quality" and reusable sleepers. 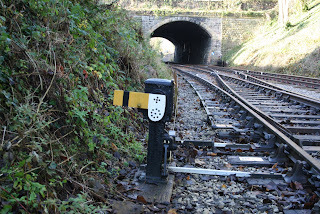 The signal post and sand is now at Shottle and the sleepers at Wirksworth. During this exercise a tree which had been reported as restricting the flow of the River Ecclesbourne at Bridge DJW 8, just north of Postern Lodge, was moved with the aid of the Komatsu. However, the highlight of the day was the actions of our new, slightly more youthful than the rest of the team, member who rescued two sheep caught up in brambles. It turns out that he has some experience in farming! The Booking Hall reported a new milestone with Online Santa bookings overtaking those taken online last year which bodes well for the final financial outcome of this year's adventure. The Pullman Buffet Car had a sticky start with no power being available but it did come to life after David's ministrations but we don't know really why, which is a little troubling. A potential customer for derailment investigation training had a good introduction to our facilities and I am hopeful the end product will be income for the enterprise. Another bumper Tuesday with the DST working on all three locomotives in their care. Henry Ellison began to receive a brick arch, Kathryn continued research work and No3 was shorn of its buffers in preparation to receive new improved ones which will damp some of the oscillation felt by our Ravenstor passengers. The VCT resumed their attack on the area south of Idridgehay reporting two good fires and the LMSCA continued work on the Brake Third Open. The Mark 1 BSK also made progress with the south end Pullman Corridor Connection being attended to along with some other restoration tasks. The PWT had less than ideal conditions to continue with the fishplate greasing task and achieved a remarkable 18 pairs as they head from Shottle to Duffield. The team also sorted the remaining sleepers at Shottle to release some for resale as "garden quality" which will be tripped back to Wirksworth tomorrow. The SBT have achieved a splendid 30 ft of first course of the new platform wall. There was a great deal of dmu activity with the underframe of the "Bubble Car" painted and much head scratching following a fault on Santa's Grotto Car. This has resulted in a last minute substitution which has given the LCC the vapours. Nonetheless, she is rallying round for an lot of work to get the substitute vehicle into shape for the weekend. The water heaters in the Ladies and Staff toilets have caused a lot of work for David but he has now resolved these irritating problems. The Booking Hall, amongst many other things, has taken delivery of the Christmas trees for Wirksworth and Idridgehay requiring yet more energy to prepare them for Saturday. The Pullman Buffet Car received a pleasant amount of regular customers together with some of our own team making opening worth while. PS - special thanks to the "volunteers" that felled the tree south of the Cromford Road bridge curing a niggling complaint from a neighbour that has been bubbling along for 18 months or so. These volunteers, who are competent tree fellers, comprised Richard from the Station Garage together with Phil and Mick Dalton, farmers of this Parish. Rewards have been dispensed at The Malt Shovel to everyone's satisfaction. was followed by some decorating in the train. the paint will dry in time. After a cold and damp start Iris set off on her last day of service for 2012 and plodded down the line of Derbyshires friendly railway and for the passengers who braved the cold it proved an enjoyable day out with plenty of warm food and drink available in the Pullman buffet many thanks to Graham , Andrew & Richard for crewing Iris on such a cold day..
Down the yard the Dmu team where busy working on the 119 or so they said as the curtains on the dmu where installed and tested then what sounded like snoring came from within , whilst young jack excelled himself with a brilliant repair job on the faulty engine part which allowed the engine to burst into life once again. The steam team worked hard again trying to warm the bolts up under Katherine to allow them to further dismantle the mechanical stoker whilst Bob was seen to be grinding & sanding away on Henry. On the Ravenstor section Stuart and jake cleared away the brash left after the felling of a tree south of Cromford Rd Bridge and the blocked culvert was also cleared to allow the water to flow away again . Congratulations also go out to the four members of staff who completed the advanced site shunters course although the mind still boggles with some of the answers offered , anybody got an aspirin as Ive suddenly got a headache . Well its now off home for me a nice cuppa and hot shower await. stations on Wednesday from 10.30 (meet at Wirksworth). Another month comes to an end with quite a delightful group enjoying a Drive a Diesel Day. This, again, was most ably hosted by Lewis, Richard and John which concluded our driver experiences of 2012. The programme of steam and diesel experience days yields most useful revenue but the skills and welcome extended by the members of our team who participate also has an immense public relations effect on people that would have not otherwise known of our existence. Today's lead customer was returning for a second experience having enjoyed the first one so much and he said he had set the alarm for 0455 to travel up from Clapham - now there's proof that we are getting something right. Further work on the Guards compartment of the Bubble Car was in progress together with polishing of the exterior furniture of the vehicle. It was also good to see Dan and Derek putting in an extra day to move the Mark 1 BSK project forward. Anton returned after a well earned break to get up to date with the doings in the Booking Hall as we await the arrival of Santa and the Pullman Buffet Car welcomed regulars and provided lunch for our experience customers. It has been pleasant, sunny and very cold through the day. The weather looks set to challenge us in the coming weeks. Firstly, a terrible omission from yesterday's report that kept me awake all last night except from a brief period between 2200 and 0700. The LCC, together with husband of LCC, prepared Santa's Grotto which involved quite ingenious solutions to preserving the integrity of what, after all, is an heritage vehicle. June has done a splendid job and should be congratulated on her hard work. Today, the PWT concentrated on Shottle and continued preparing for the reconfiguration of the south end of the loop that will eliminate severe speed restrictions as the train journeys into it. The VCT renewed their endeavours south of Shottle and were probably the only warm people on site with three large fires to consume the brash. Work continued within the "Bubble Car" as panelling out of the Guards compartment progressed. The rest of the dmu team resolved a fuel pipe problem on Iris and fuelled it for its last service day for a little while. A fuel leak on L J Breeze was also investigated and declared acceptable for a few more outings. In the south further improvements were made to the staff car park at Duffield with the aid of locomotive ash moved to site. I am also grateful to Mike Evans and John Allsop who have had an opportunity to clear the gutters of the Royal Saloon now it is undercover which will allow further sealant to be applied to prevent water ingress. The Pullman Buffet Car traded steadily and the Booking Hall bottomed the recent Santa bookings for despatch to our customers. The round up this week revealed that we are 13% up on this time last year and that online reservations represent 75% of the total. Today's photo demonstrates the size of vehicle that supports some of our test customers. 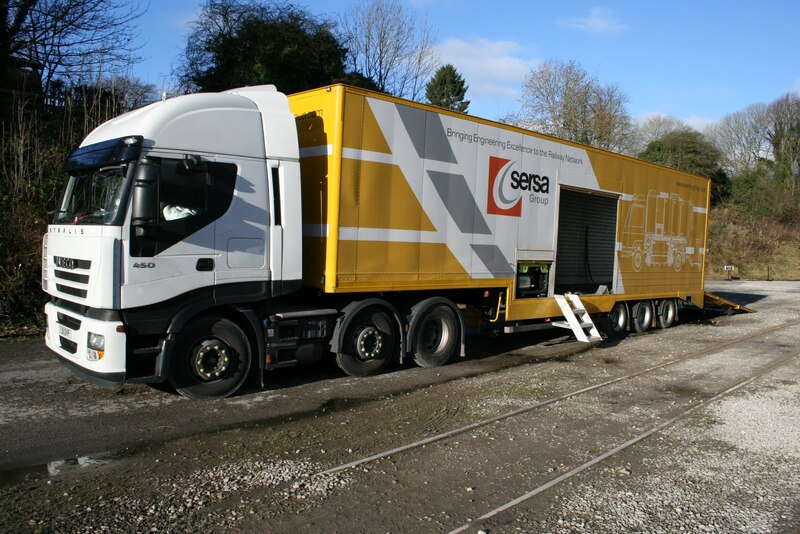 Another most productive day with our customer accomplishing their EMC testing at Wirksworth and then departing for Barton-under-Needwood for further work to complete the acceptance of the vehicle to work on Network Rail. The manufacturer from Germany operates from a former DDR "half" roundhouse and has cheered Bob Gibbens as they can supply spares for Trabants, in fact the Managing Director has a Trabant powered speedboat - the mind boggles. A photo is attached that shows the vehicle which bears an uncanny resemblance to our own Multicar. The PWT had a good day with all the track patrolling going on as planned and the other part of the team dealt with a number of tasks including clearing the area of the south Shottle points, collecting the portable toilets from Duffield and distributing them to new locations and collecting a wagon of logs for sale. The SBT installed some 50 ft of concrete base foundation and, at Wirksworth, a walling contractor has started to remedy the problems in the Car Park. The Filing Fairy continued her massive task and the Booking Hall has a most satisfactory day with Santa and Group Bookings. The Pullman Buffet Car was test driving a new "chocolate log" and introduced our customer to the joys of the Pullman Bacon Buttie. It was good to welcome a test customer and their team which included a number of German technicians who were ably hosted by Mick Thomas with help from David Newby at the start of their two day stint with us. 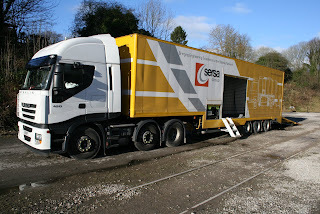 Interestingly, the test vehicle was built on the same principle as our very own Multicar but adapted for rail grinding and significantly younger. The VCT returned to their clearance site south of Idridgehay and dealt with much brash by two fires and the PWT started to strip down the pointwork recovered from the Shottle south area in the most inclement of weather conditions. The SBT erected some 27 metres of shuttering to enable reconstruction of the base stonework for Shottle platform and the ingredients were delivered to Wirksworth to allow them to proceed tomorrow. The LMSCA continued with the construction of new window frames for the BTO and assisted with the restoration of the Mark 1 BSK. The DST worked on all three locomotives with continued efforts to release the mechanical stoker on Cathryn, painting of Henry Ellison and winter maintenance on No. 3. Fred & Iris gave the Mess Hall another thorough clean and Mike Billings worked on the Komatsu's flail head attachment that is in need of major surgery. The "Bubble Car" had yet more gutter work as this project moves into its final stage. The Booking Hall continued to process Santa bookings with another pleasant flurry today and the Pullman Buffet Car capitalised on our test customers who were drawn to Wirksworth cuisine. After a very damp start the friendly railway in Wirksworth got down to doing what it does best and looked after a steady stream of visitors many who sampled the the fine delights of the Pullman Buffet which included a Christmas themed Sunday lunch. Down the yard the DMU group worked hard to restore the 119 to pristine working condition.The Lmsca where like busy little bees on a hot day replenishing the windows on the bak coach. The duty conscript and his minders toiled hard not only cleaning the inside of the 3 car unit but going around the car park and paths on a general clean up. Rodney surfaced above the water around Wirksworth to collect waste ash for improving the the car park at Duffield, whilst Down in the training room the guards huddled together around the cauldron to discuss and prepare a mutual remedy for next years running of trains. I'm sure they will all now be sat with their feet up and reflecting on a job well done. It was a cold, wet wintery day down at Derbyshire's favourite branch line. During her preparation for service it was found that Iris had a fractured fuel pipe to her heater and the 2-car set was quickly prepared for the 10.20 Duffield service. The lone quick fix fitter expertly dealt with the fault and Iris was able to return to her normal duties at 12.20. Down the yard the LMSCA concentrated their efforts on the window seals of the BSK. In the shed the 8F group continued the dismantling of Katherine's mechanical stoker. The lone quick fix fitter turned his attentions to a fault with the Bubble car's lights and again his administrations proved successful and the fault is now rectified. Finally up at Duffield the station foreman set about fixing some broken car park fencing. The sun shone through the day and the wind had dropped away enabling me to take a photo at Duffield, in pleasant conditions, that will illustrate our unique signal there for a forthcoming internal publication so I thought I would share it with you! I have been gently challenged on my use of the word "unique" to describe our two single unit railcars. My claim was based on their regular use on all service and charter trains through the winter period which, I think, is peculiar to us? I omitted the endeavours of the VCT from yesterday's report as they were very much present south of Idridgehay cutting and burning. Wirksworth was fairly quiet today with continued work to complete the "Bubble Car" and further processing of Santa bookings in the Booking Hall. The next shareholders mailout is a task that also made modest progress. The Pullman Buffet Car saw returning regulars from Severn Trent Water that have adopted us as the cafe of choice. It was delightful to welcome a returning customer who wished to test a new system of measuring track deflection with a gismo that Bob Swepstone would much appreciate. The tests involved L J Breeze and I am grateful to David Newby who drove the locomotive to the client's requirements. The essence of the tests where to provide a refernce via a camera that recorded the changes as a train passed by. It was confirmed that our track at that point deflects within tolerance which is comforting. The "Bubble Car's" guttering was replaced where repairs had dictated its removal and the Class 119 restoration team started the second engine to their combined delight. LJB's activities revealed a fuel leak that was traced to a missing copper washer on one of the injectors. This problem was resolved by the dmu team resulting in a splendid minimalisation of the golden product not being wasted. The dmu team also orchestrated a shunt to put the Royal Saloon under cover for the winter which was most helpful. The Pullman Buffet Car had quite a day with contractors to Severn Trent Water knocking on the door at opening time, regular clients and today's customer adding to the activity. The Booking Hall processed further Santa bookings and we are now at some 12% ahead of this time last year with 75% booked on line. There is still lots of capacity available on all trains and it would be great to beat all previous year's records. A most unpleasant and very wet day that frustrated our PWT and SBT ( a new term for you to absorb representing the Shottle Building Team). Effectively no real work was achieved apart from a transmission of timber between Hazelwood and Shottle by rail by rail/road Landrover - maybe another first. The dmu team have applied the final lining out of the "Bubble Car" which represents the conclusion of this splendid exercise where we are definitely unique in being able to offer economical passenger services with single unit railcars. The Filing Fairy continues the task of competence recording and the LCC delivered and categorised the presents acquired for the Santa trains. The FF husband made strides to prepare for slinging courses with a willing volunteer acquired from Network Rail. The Safety Management Review Group have finalised the new Rule Book Assessment that is now lodged under the member section of the web site with many thanks to Robin. The Booking Hall had a productive day processing incoming Santa bookings together with a coach company who would like to visit us next September. The Pullman Buffet Car had a thin day after visitors were surprised that we were open but seemed reluctant to engage with a sales opportunity. Presumably they don't pay for anything anywhere! A few folk on site today, well over 50 folk making it quite difficult to keep track of all the goings on. Nonetheless I will try. The dmu team continued their attack on the Class 119 and things beneath its sole bar whilst the DST continued with their dismantling and assessment of Kathryn. The PWT departed for the south and greased some seven rail joints reporting a particularly difficult day requiring our whole supply of refurbished bolts. They are tackling the alternate joints which seem to have been untouched for around 40 or 50 years demonstrating the value of this tedious exercise. The Watt Bolt Company has been in production for two days in order to try and keep up with demands. The Shottle reconstruction team have made further progress on this lengthy project and will journey to Hazelwood tomorrow to obtain timber for shuttering to allow casting of a smooth base for the reconstructed wall. The LMSCA are quite proud of a new glazing technique for the new windows to be fitted to the BTO as the large guards area is reduced to create room for wheelchair bound passengers. We welcomed back Dan Smith who is going to mastermind the return to traffic of the BR Mark 1 BSK. I am most grateful to the recovery team that descended on Bletchley Park last weekend following the generous donation of signalling equipment from the model railway club that is being evicted from the site. The prize was a four lever ground frame with various shunt signal discs and a signal post with associated semaphore signals. Many other components and products for the EVRA shop were also gained. The Booking Hall received a further flurry of Santa bookings and delivery of a new leaflet that encourages us all to think of the Railway in our will. The Pullman Buffet Car looked after the inner needs of a volunteer teams. A drizzly and productive day. Another shiny Sunday in Wirksworth, or it was once the frost had gone. activity was general upkeep or further restoration. A very busy day down at Derbyshire's favourite branch line. Following on from last Saturday's filming, Iris again starred today with a sound recording team arriving to record the dulcet tones of her engines which will be loaded onto digital sound chips for model engines. A full train of passengers left Duffield at 11.10 en route to Wirksworth with the on train crew acting as creche stewards due the amount of junior travellers. The stray sheep on the line further helped keep the young passengers amused. We welcomed visitors from as far a field as London and Norwich with some visiting us for the first time following a recommendation from friends who recently enjoyed our hospitality. They compliment us on how clean and well kept our stations were. The buffet coped admirably with the unexpected rush of patrons and the model railway received a number of visitors. Down the yard the LMSCA focussed their efforts on preparing the BTK for the fixing of the bellows. The DMU restoration team carried on with their work on the class 119. Inside part of the team completed the side panels, trimmed No.1 side around the top and put up the luggage rack. The rest of the team worked underneath the unit and the coolant system was completed and declared fully water tight and ready to run. In the shed work continued on the Bubble car's dome. Finally, a group of very pleased volunteers returned from their adventures at Milton Keynes and have successfully rescued 2 home distance signals and a 4 lever frame as well as other signalling miscellany. John carried on with the lining out of the "Bubble Car" and test fitted the new arm rests he had manufactured for the Class 119. The latter required fine tuning so they have returned to the Allsop workshop for modification. The Safety Management Review Group met to start updating the Rule Book Assessment paper and the Sectional Appendix. Our small customer returned for the second of their two day session. It was good to see Richard Flatman who is making a sound recovery from his major heart surgery. During the afternoon we welcomed David Horne, MD of East Midlands Trains to discuss areas of mutual interest and see how we may work even more closely together during 2013. Two events were missed from yesterday's lengthy report. The first was that there was further interior work undertaken on the Oaks Brakevan project and the second was to record the first Online sales of the newly introduced "stocking fillers" put on offer through the web shop. Repairs were undertaken to the pedestrian gates at Idridgehay where the prognosis was that one good one could be created from the two returned to Wirksworth. The Booking Hall had an admin sort of day and the Pullman Buffet Car dealt with a steady trade. A lengthy report tonight as a massive amount of activity was achieved today. A splendid team arrived to deal with the preparation for three significant projects that involved a great deal of delicate shunting. Faraday was returned to the Museum line as its restoration to productive use is beyond us at the moment. The chassis of The Duke and the wagon containing its water tank were also placed on the Museum siding so that serious work to return the locomotive to steam can commence. The LMSCA Stanier Third Open was journeyed to the Maintenance Facility to enable a contractor to commence remedying the fire damage and move the coach along to returning to the operational fleet. The Mark 1 BSK moved to the Carriage Siding to enable a strategy to fast track this vehicle into service be implemented. I am most grateful to all involved with these positioning moves that set the scene for restorations in the immediate future. The VCT spent their day just below Cromford Road bridge to cleanse the retaining wall on the UP side of its remaining vegetation with honorary member Swepstone. A very large fire dealt with the brash and sundry products from this exercise and am pleased to report that this concludes satisfaction of the requests by Network Rail and Amec. The PWT were engaged at Shottle placing all surplus rail onto the Sturgeon and recovering pointwork deposited in the grass at the south end of the loop. The platform area was surveyed and levels taken to deal with its raising by some 8 inches. The temporary access furniture was removed as this will not be needed when the station reopens. John applied the final gloss to the "Bubble Car" together with completing the yellow warning panels leaving lining and lettering being the only tasks left to complete on this marvellous restoration. The Filing Fairy returned to the "Forth Bridge" of getting all our records up to date and she really deserves out unquestioning support given that there are over 200 of us on the books at the moment. John Allsop also applied sealant to the Royal Saloon's roof to try and stem water ingress and the dmu team gave the 2 Car set an exterior wash. In amongst all the activity was entertained our small customer who reported a satisfactory day. The Booking Hall was in revenue raising mode as tow of next year's customers used the over the phone credit card opportunity and finalised this weeks Santa statistics. We are now 13% ahead of where we were this time last year with 76% of the bookings being through the Online shop. The Pullman Buffet Car had a satisfactory day with the pleasant weather bringing out the passing trade and our volunteers eating with some vigour. Not bad for a November Thursday. Much endeavour on many fronts again with the PWT taking the leading role. Track patrols again proved their use to the safety of the line with Tony W spotting a broken fishplate between Idridgehay and Shottle resulting in its replacement. The PWT also organised a Works Train to transfer our former "Shell" tanker to site at Shottle station that will provide the water supply for mixing cement. I don't think it has travelled so far for many years! Coping stones were removed from the south end of Shottle platform and a modest amount of ballast remaining in the Rudd was deposited on the southern pointwork there. There is a growing number of our team taking an interest in the Shottle platform reconstruction and I am very pleased to report EVRA's support in providing the surface material when the project is nearing conclusion. The "Bubble Car" project moved ever forward with the east side gutter painted and the Head of Gardening moved more brash to the Wirksworth burning site. The Pullman Buffet Car had a quiet day but the Booking Hall processed a flurry of Santa bookings. Another test customer emerged after some 7 months of silence which brought further anticipatory joy to our world. A most active day in what many perceive as the closed season. I am most grateful to the VCT who arrived at Wirksworth mob handed to clear vegetation from structures advised by Amec acting on behalf of Network Rail. Their products resulted in two splendid fires to burn the brash of these activities and it was noted that Bob Swepstone was amongst them getting down and dirty. The PWT continued the essential work of fishplate greasing between Shottle and Duffield achieving a remarkable 34 pairs. The Komatsu was used to grade and tidy up the "car park" area at Shottle following the departure of the Mess Hut to its new location. John and Chris have taken down around 30ft of the platform wall as the project to rebuild commences. The DST concentrated their efforts on Henry Ellison and the LMSCA prepared the Third Open for its move to the Maintenance Facility and manufactured the framework for a new window in the Brake Third Open. The Filing Fairy made further strides with our record keeping, David replaced the water heater in Wirksworth's ladies toilet and Fred & Iris gave the Mess Hall a good clean. All activities that go without notice but so essential to our enterprise. Equally, in the south there was a deal of activity to provide a new door stop for the ladies toilet, collection of leaves and weeding. The dmu team were most productive with John Allsop cutting and preparing seven stepboards for rotten ones on the Bubble Car and were fitted today. 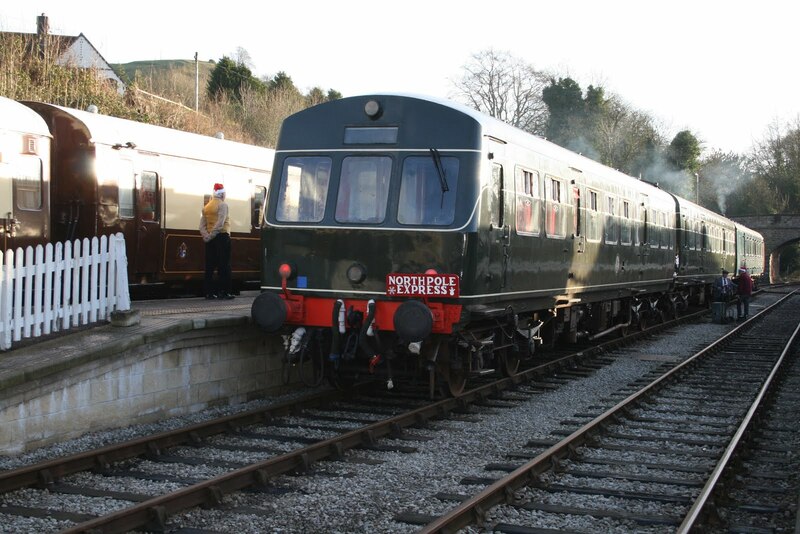 Panelling was fitted to the Class 119 as this vehicle strides forward to star in an event in 2013. The Pullman Buffet Car had a steady and satisfactory trade with the Booking Hall dealing the usual range of visitors and phone calls. After a very fallow time I have dealt with three test enquiries today which brings a warm glow and entertained a location manager that may yet yield some joy. ripple of activity in our comfortable, contented serenity. Today's sunny weather had a positive impact upon visitor numbers with all our scheduled services enjoying good passenger numbers. At Wirksworth station we played host to a group of media and film students from Chesterfield College who were making a short film as part of their course work with Iris starring in a supporting role. Down the yard the LMSCA were in attendance lubricating corridor joints in 27001. The DMU restoration team split into two groups with one concentrating on preparation work in readiness for the panels being fitted under the standard class windows of the class 119. The other group focussed their attention on washing the exterior of the 3 car set ready for its trips to the north pole. At Ravenstor station a number of volunteers spent the day clearing the station path towards the stone centre of excess vegetation as well as level its surface. Finally, at Duffield station the garden received a general tidy up. Bob Swepstone has been beavering away in the background over the last couple of days to assist Network Rail's contractor to inspect retaining walls around the Wirksworth area. This has resulted, in the immediate future, in the closure of the Wirksworth Car Park while further checks are made and further vegetation cleared for a complete assessment. It's a reminder that all our structures are some 150 years old! Good news on the Santa front with bookings within a smidgeon of being 30% up on this time last year with the great preponderance being online. The Pullman Buffet Car had another steady day and the Booking Hall concentrated on house keeping. PS - there is a Ravenstor working party planned for tomorrow assembling at Wirksworth for 1000. This is to take advantage of the closed period for care and maintenance of our northernmost outpost. The Online Shop now offers Sunday Lunches throughout November and a range of stocking fillers for Christmas. Many thanks to Robin and Leigh for putting the technicalities together. Today was the 12th Anniversary of the start of work to renovate the Duffield to Wirksworth branch line. The emotional effect of this date is lost on the majority of the present volunteer team that has grown from an initial eight to over 200 in the intervening period. As you look around today it is difficult to imagine what has been achieved in quite a short time and it is with some pride that I can announce that we have opened a new section of our Railway. The Shottle deviation, or bypass, is now installed to enable the platform to be reconstructed with the full, and financial, support of our neighbours at Peak Oil. This Company were always doubtful in the early days about our intentions but are now very much behind the actions we propose there. 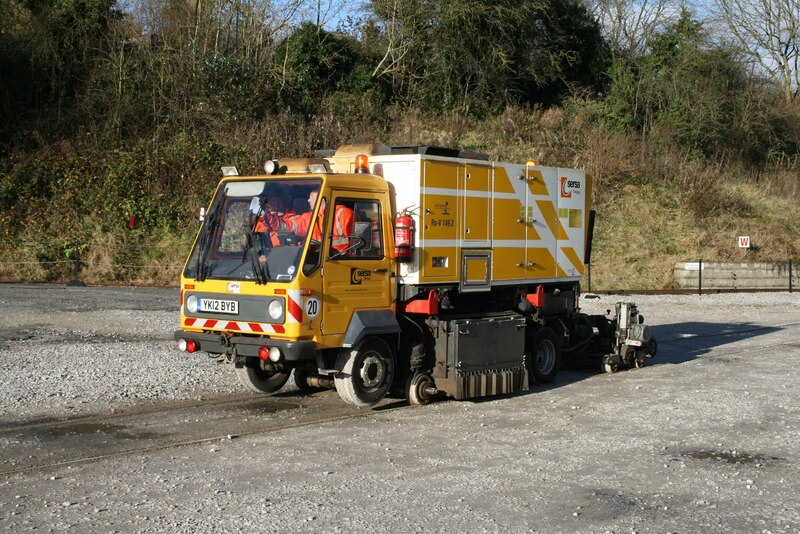 EVRA have stepped up to ensure the surfacing will mach the quality achieved at Idridgehay. Saturday see the first use of the Shottle deviation which will allow transit over a brand new section of track never, ever, experienced by any mortal! The VCT were working a little south of Idridgehay, near the site of Colin Blowers memorial site, and reported four roaring fires in addition to an earlier one south of Shottle. The PWT can glow in their achievement with the Shottle loop that looks as though it has been there for ever. A most satisfactory session with Peak Oil, the owner of the station building and surrounding area, has resulted in a clear plan for the future with that Company supporting the project financially. The dmu maintenance team concentrated on Santa's three car set to deal with a problem alternator. The Bubble Car moves ever forward with the first gloss being applied to the Up, East, side of the vehicle. Today's photo is of the new secure transport for volunteers so that they can't escape before the job in hand. This is not an April fools joke but the PWT are seeking a redundant bath in order to blend the fishplate grease that tend to separate in time. I have suggested that there would be a photo opportunity as they resemble the grape harvest aiming for Wirksworth's first bottling. The main activity today was the PWT travelling to Duffield to recover surplus sand left over from the reconstruction of the station that will now be used for the Shottle platform project. The team then filled two wagons with logs for sale, one at Shottle and one at Wirksworth. 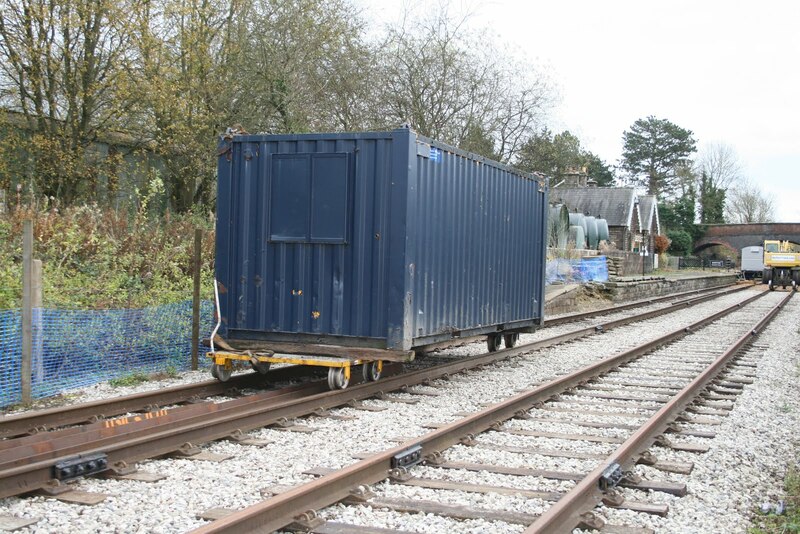 Many fishplate bolts were inserted into the Shottle loop line and the Shottle Mess Hut was moved close to site and the S&T van put into the platform line as a working base. Temporarily this has closed the Railway at Shottle pending diversion through the loop that will be accomplished tomorrow all being well. Amey, under contract from Network Rail, attended Wirksworth today to commence examination of retaining walls and the Head of Gardening was in action barrowing debris from the garden to a burning site. The Filing Fairy made further progress with our record system that will soon be the envy of any heritage railway in the UK. The Bubble Car received further attention from John Allsop who was very bullish about its completion date. 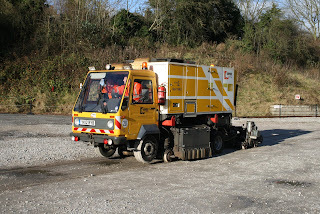 A photo supplied by Leigh shows how much the vehicle has progressed. The Pullman Buffet Car traded quite well and the Booking Hall processed a very heartening number of online Santa bookings. A cold and drizzley day but p way were out in force greasing fishplates and achieved 26 pairs. P way mechanical dept removed the rest of the radiator elements from Breeze for cleaning and resealing prior to adding antifrezze. Yet another branch of p way spent the day retapping fishbolts and added another 34 to the pile. VCT were again at Idridgehay with one but enormous fire clearing yet more linside. Mike the flail returned the flail head to Wirksworth for repairs but it was pronounced dead on arrival and needs 2 to 3 days welding work to repair. LMSCA carried on with repairs to the LMS brake. Steam team spent the day winterising No3 and also removing bits of Ellison from the shed. DMU team had a shunt to move the bubble car to the other side of the shed for painting taking the time to wash the dust off as well. Lots done despite the weather. A sunny, crisp day as we welcomed three participants on our penultimate Drive a Diesel Day of 2012 very ably hosted by John Allsop and Richard Buckby with John Evans helping with the afternoon session. Catering had to be spot on as John, Angela's husband was one of today's clients. The day included shunting the S&T van to the Car Park to aid this week's permanent way activities. The Tony Watt, the fishplate bolt refurbisher, was in business retapping the fishplate bolt nuts declaring that he was saving me money by each nut dealt with and, indeed, he was! The Booking Hall welcomed our visitors and the Pullman Buffet Car had a bit of a thin day overall except for the Drive a Diesel people. PS - after the modest success of our first advertised Sunday Lunch offering we will try the rest of November and place it on line. The team will be encouraged by your support that may lead to us being confident that the product will work through the Santa train programme. PPS - I receive, on our behalf, notices of criminal activity in the Wirksworth area and there is a noticeable rise in thefts and break-ins. Please ensure everyone does all possible to secure the site by keeping our three main gates closed and locked when the last man leaves. pleasant week to a close, as we had been quite busy due to the half term. conclusion about the shade of red necessary to match the carpet. A cold, crisp, mainly sunny day where we welcomed the final steam experience customers of 2012 ably hosted by Mick and Hylton. We also gathered in three drive a diesel day participants excellently looked after by Lewis and Richard. John Evans graciously moved between the two experiences to ensure all the accompanying families enjoyed their day as well. It was also satisfying to provide a little test track service to our rail flaw detection customers as they proved their new software. The dmu team concentrated on the woodwork in the guards compartment of the Bubble Car enthusing about the progress made today. The Booking Hall welcomed our many guests in addition to accomplishing and end of financial year stock take. The Pullman Buffet Car benefited from the sheer number of people coming and going through the day. 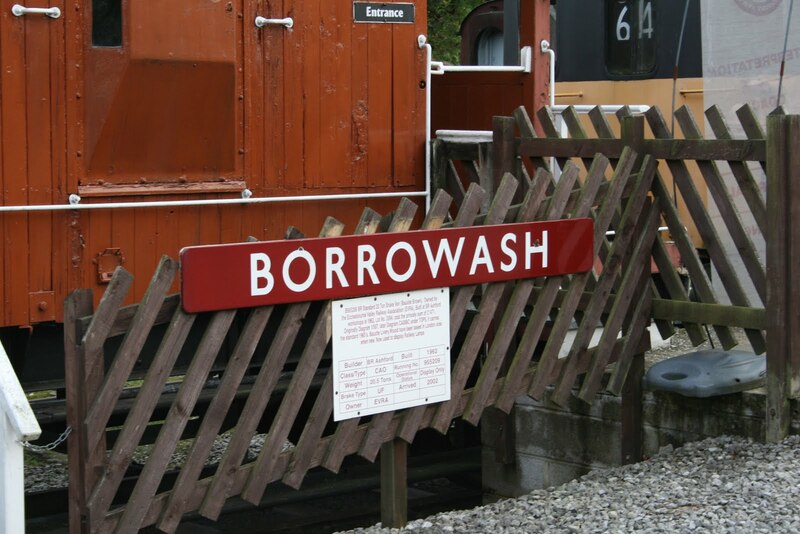 Lastly, the caravan situated on Wash Green dock that provided accommodation for "Ashford Bob" until he found the expense of coming to Wirksworth beyond his resources has departed for pastures new. Another end of an era story as the caravan was well beyond its sell by date and Bob made quite a contribution to our enterprise in its formative years. He has found solace on the East Kent Railway which has similar mountains to climb. Well, what a surprising day as we operated for the first time a Thursday half term service at this time of year. To encourage us a minibus turned up for the first train from the Castle Donnington Volunteer Centre driven by a Great Central volunteer with 17 passengers and, after that, the only way was up. Very satisfactory results from all departments in this experimental toe in the water at this time of year. We had the very first ever online booking for this coming Sunday lunch opportunity, thank you John, and I hope there will others before the weekend. It is very romantic in the Pullman Second Open with our new lighting system! The dmu team dealt with the alternator belt repairs to 51360 and LJB benefited from the attentions of David and Doug who sorted radiator leaks and demonstrated how the radiator was fixed in manageable sections revealing the sealing washers had degraded. The PWT fixed the newly manufactured lift fishplates to the Shottle loop and dealt with missing fastenings on the south loop point. The Shottle deviation moves ever closer. The VCT dealt with more blackthorn south of Hazelwood, enjoyed two large fires and repaired the fence exposed by their clearance work. The Booking Hall welcomed our many passengers and processed yet more Santa bookings which are now 20% ahead of this time last year and the Pullman Buffet Car had a satisfactory day although many of our passengers rushed off without a purchase. Maybe the economic situation continues to affect discretionary spend. 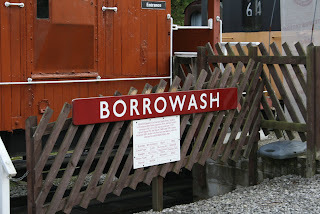 Tonight's photo is of the enamel sign from Borrowash signal box that now is exposed to the light in Wirksworth. The history of the sign is that it adorned the box until closure with the introduction of Derby Power Box in the 60s. At that time I was working at St Pancras and returned home with my washing to find that T W Ward had put a hawser around the box to pull it over and burn it. I asked if I could have some parts before the pyre and was encouraged to help myself. The sign has travelled extensively to New Mills, Romiley, Bolton, Guernsey, Southampton and Sheffield Park before ending up at Wirksworth Moor. It deserves to be exposed to the general public after being in hiding for so long.